Mussels were without a win in 12 matches as EP visited Middle Road but Martin Mutungi’s 72nd-minute strike saw the home side come out 1-0 winners in the SCFL Premier Division clash on Saturday. It was a second successive defeat for Paine’s side after they exited the FA Vase last time out. But East Preston boss Paine found the Shoreham defeat tougher to take. He said: “It was embarrassing to be honest. 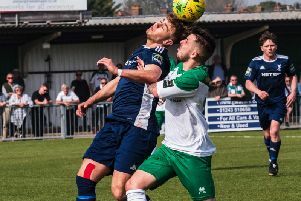 “We came up against an average Shoreham side but did not deserve anything. “We saw a lot of the ball in the first half but didn’t really do anything with it. “Shoreham were without a win in 12 matches before we visited, I’d say it was our worst performance of the season so far. “We’ve had some really good results, beating Saltdean United and Newhaven this season, but then we perform like we did on Saturday. It was a game lacking in any real quality with a solitary goal proving the difference. Mutungi was the man who got the goal after 72 minutes, taking Shoreham to all three points. Substitute Sam Pidgeon wasted a glorious chance to level late on. East Preston will be looking to get back to winning ways when they host newly promoted Langney Wanderers on Saturday. EAST PRESTON: Bentley; Jenkins, Lyne, Searle; Pattenden, Barnes, Brodie, Quirke, Beaney; Nicholson, Huet. Subs: Pidgeon (Searle), Rafferty (Huet), Heryet (Nicholson), Fernandes, Heryet.